Spelling: With a over 40,000 word dictionary, SpellingTime comes pre-loaded with 40 lessons for K-8th grade appropriate word lists. Or, as a parent or teacher, you can easily enter your own word lists and SpellingTime will automatically create a week’s worth of lessons, quizzes and tests around your own list with the goal of achieving 100% on the Friday spelling test. Math: You can set up a child's lesson to mirror what they are doing in their current curriculum. For example, if the child is on double digit addition and single digit multiplication, the program can focus on just these two areas providing invaluable practice and reinforcement that is certain to provide them with the tools to ace their next test. Or, BigMathTime can automatically generate grade specific and subject specific lessons as per your requirements. Vocabulary: With an extensive library of elementary through SAT prep words, BigVocabTime comes pre-loaded with word lists OR, as a parent or teacher, you can easily enter your own word lists and the program will automatically create a week’s worth of lessons, quizzes and tests around your own list with the goal of achieving 100% on the week’s vocabulary test. U.S. States: Every elementary student will be confronted with the need to know their US State facts to mastery. BigStatesTime is the ultimate tool in learning the state's location, capital, spelling, abbreviations and general state facts. The program allows parents/teachers to add additional facts which will be included in the child's lessons and the program culminates in a “State Mastery Exam” that, if passed with 100% mastery, awards the child a State Master Certificate. 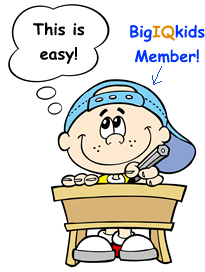 As part of the TOS Crew, we received a subscription to the Big IQ Kids Premium program, including Spelling, Vocabulary, U.S. States, and Math. My 9 and 12 year old daughters were my "guinea pigs", using the program several times a week. With the program, your child can use the preset program based on their grade level or you can customize it to fit your needs. Add in the words you have been studying for spelling. Set the math problems to what your child needs to review. Add a little bit of trivia about your state. Whichever way works best for your family: the preset or the customized. We used the preset, and it worked well for us. Each lesson lasts about 10 minutes. Short enough to become a part of your daily routine. Most children will sit through a 10 minute lesson without complaining. My children didn't want to sit down and do the lessons, but once they got started, it was over before they knew it. The lessons are in very manageable chunks. After you complete a lesson, you earn a token that you can use to play a game or change your character. Most games are worth one token. But my daughters' favorite game was two tokens. (Which I liked. Because they had to do 2 lessons to earn the right to play that one.) It is also one token to change your child's avatar. My daughters rarely used that option since they felt like they would be wasting their token, when they would rather play a game. Too funny. My 9 year old's favorite subject was the SPELLING. My 12 year old's favorite was the VOCABULARY. They both made a great deal of progress in their spelling lists. That right there is worth the effort to me. Seeing them conquer words that they couldn't a few weeks ago is a VERY good feeling. And it came easy with the Big IQ Kids system. A nice bonus is the email updates that the company sends to the parent. It is a nice detailed report of how your child did on that day's lesson. My daughters' one complaint: They did not like the robotic voice of the "tutor" that guides you through the steps of the lesson. It is a very helpful guide, but I agree that the robotic tone is a bit annoying. :) We would much rather a normal human voice. The site also offers a free version which might be a good place to start before you spend the money on the Premium Site. This list explains the differences between the two. See more details on this award-winning program. Disclaimer: I received these program free of charge, as part of the TOS Homeschool Crew. The above is just my opinion. Please remember that opinions may, and do, vary. I enjoy reading the Chronicles of Narnia books. So I was very excited when the first movie, The Lion, the Witch, and the Wardrobe was released. I was not disappointed. It was wonderful. Then, once again, I was happy to see that the second installment was being produced. And now, yet again, a third installment will be available on DVD on April 8th. When the big night finally came, we were all so excited. We watched with wonder and were not disappointed. The movie will be a great addition to the series. My 9 year old mostly enjoyed the movie "as a show". But my 12 year old enjoyed it as an allegory. She loved pointing out all the symbolism that she caught. And I do say, she caught quite a lot. I was surprised that she caught so much of it. Those who know about the series, know that it is a Christian allegory representing good and evil and that mighty Aslan represents our God and Savior. I love this aspect of the books and now in the movies. The symbolism, and the life lessons and morals. The lesson about greed and the downfall of it. The lesson about being happy to be just who we are, without trying to be anybody else. The lesson about temptation and how we must make a personal decision to resist it. The lesson about how important family is and to stand strong and united. The reminder that love and respect can sometimes change the foulest of sorts. The reminder of how much God loves us and is never far from us. The truth that even "small" people can do "big" things. As the old hymn goes, "Little is much when God is in it". Another thing that impresses me about this movie (as well as the first two) is the amazing graphics. Such detail, so vivid and grand. The boat was absolutely beautiful. Little Reepicheep is so cute! The dragon was gorgeous . . . for a dragon, that is. :) The special effects were nice too. Lucy "transforming" into Susan. The painting's waves moving. It all draws you in for the full experience. 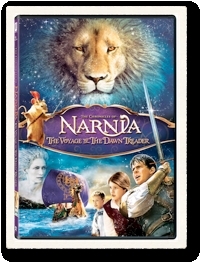 This is a wonderful choice for a family movie and would make a great gift for Easter. I have been fascinated with the Amish lifestyle for over 15 years now. Ever since my first trip to Lancaster, PA. Actually it began even before that while reading several series of Amish fiction. But once I visited the place and saw some of the lifestyle in person, the fever struck. And I had it bad. I go back to Lancaster to visit as often as I can. It is my favorite place to go camping. In the meantime, while waiting on my next trip, I continue to read the novels that I enjoy. Books about the Amish. Cindy Woodsmall has written several great ones. 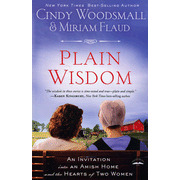 This book, Plain Wisdom, is extra special because it is about real families. Real families in real towns with real stories. I enjoyed having an insider "tour" into their lives, homes, customs, hopes, dreams, trials, and struggles. But the Plain aspect isn't the only thing to love about this book. It is also about the Wisdom. Cindy and Miriam have opened their hearts and lives to share their wisdom with us. It has the feel of a friendly chat. Just little insights and stories to strengthen your faith, your resolve. To lift your spirits and perspective. To strengthen your relationship with your family and your God. Every time I sat down to read this book, I put it away feeling so encouraged. I appreciate the authors' candor, taking the time to share so much of their lives with us, in hopes of helping other wives and moms. I say, "Job well done. Mission accomplished." Adapted from Aesop's popular children's fables, each story contains an important moral lesson gleaned from Aesop's wisdom! Several features make these storybooks quite unlike a traditional children's storybook. Traditional storybooks are great at helping parents tell a story, but much less so when it comes to teaching children to read. When words and pictures compete for a child's attention on the same page, the pictures invariably win out. What's more, when parents point to words in traditional storybooks, they will often obscure the pictures - resulting in protests from the child. These books have been specially designed to give your child all the fun of storybook time, while also teaching your child to read. Text and illustration presented on separate pages. More spacing between words to make it easier to see words individually. 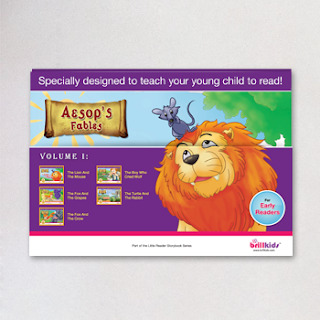 A blank flap extension to cover the illustrations as you direct your child's attention to the written text. This book set was sent to us to read with our 2 year old, for review. This isn't our first experience with BrillKids. 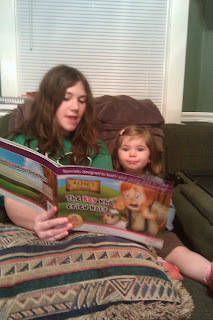 Last year, we reviewed their Little Reader program. 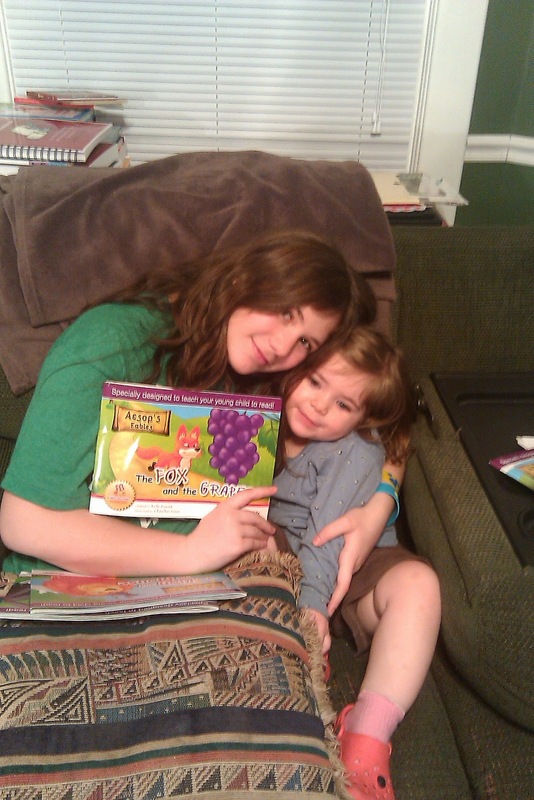 An online program intended to teach toddlers to read. It was a delightful program and my daughter enjoyed it immensely. Here is my review for that program. 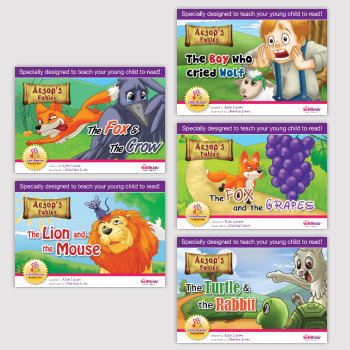 Each book is a simplified version of an Aesop Fable. 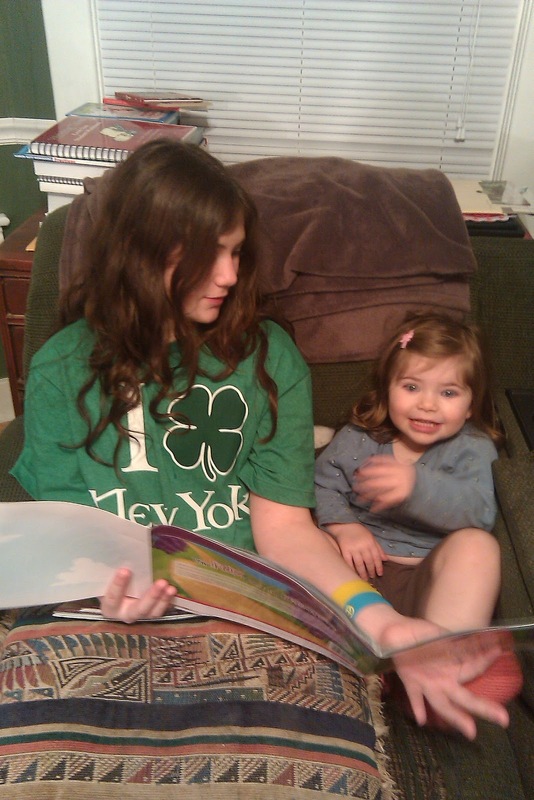 Short and sweet, geared to the youngest of readers (or soon-to-be-readers). With a nice little "moral of the story" at the end of each. The pictures are full-color on high-gloss pages. 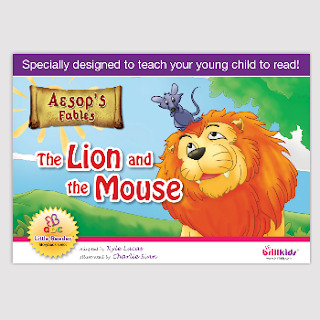 Check out the front and back cover of The Lion and the Mouse below. You can see how cute the illustrations are. The concept of the books is simple, yet unique. BrillKids suggest that young children are so busy looking at the pictures, that they aren't paying much attention to the words on the page, thus delaying their ability to read. The solution: To put the words (big and bold, with extra spacing to separate the words) on one page and place the picture on the opposite page. Then provide an attached flap to cover the picture until you are done reading the words. So you read the big, bold words to your child while running your finger under the words to show the movement from left to right. Then you lift the flap to show the picture corresponding to what you just read. Once I show the picture, I talk to my 2 year old about the picture, having her look for the piece of cheese on this page or mentioning how an animal's face looks happy on that page, things like that. Here is an illustration showing how it works. Pretty neat! I like that the books are based on classic stories, Aesop's Fables. I like that the stories have an encouraging theme and important moral, such as always being honest so that people will always know that they can believe you. The pictures are so cute and cheery; the glossy pages are a nice quality. The pages have just the right amount of words on each page, averaging 8-10 words. Enough to make it an interesting story for those a little older; but, also short enough to hold the interest of the toddler set. Also a good amount for those just starting to read on their own; so as to not overwhelm them. My 2 year old likes them. Sorry, I can't tell you what she likes about them. :) But, I do know that she does. She will bring us the books to read. When we finish reading it, she will either ask "Again" or she picks another one. She will sit through a couple of them and truly enjoys them. She listens to the story and points and comments on the illustrations. Occasionally, she will get overeager and lift the flap before I am done reading. But more often than not, she waits till I lift the flap. Whether or not these books will aid in my daughter learning to read earlier, it is too early to say. I do think that covering the picture to keep her eyes on the words as my finger goes across them sounds like a helpful idea to me. But regardless of the results, I still love these books. I still recommend them wholeheartedly. 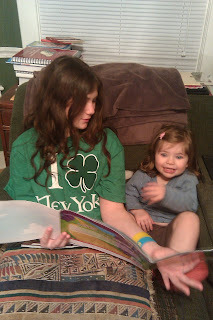 My 2 year old loves having big sister read a story to her. 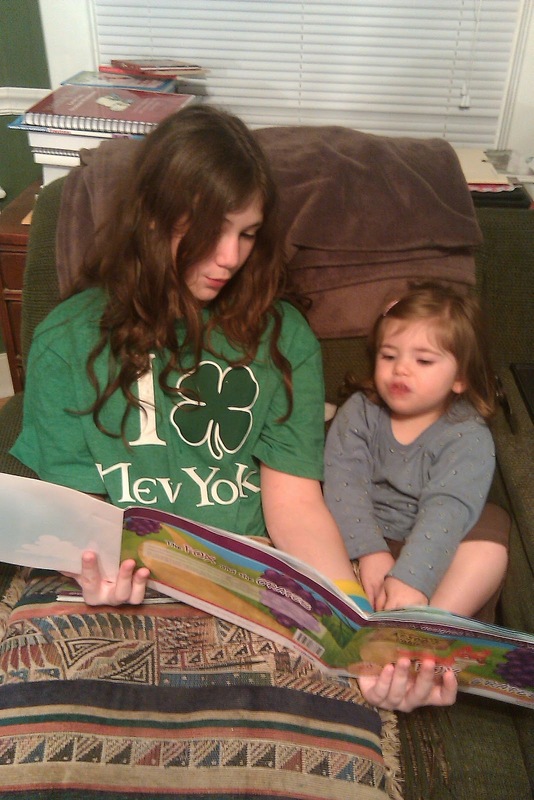 Notice how big sis follows the words with her finger, as she reads. Little one has greatly enjoyed the Aesop fables. 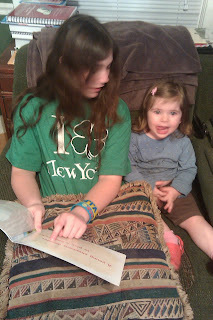 Big sis opens the flap to reveal the picture after reading the words on other page. As an added bonus, if you own the Little Reader software, you will be able to access these storybooks through the program. It will put up the words and read them to your child. Then it will show the illustration and read the words again. This is a nice plus for Little Reader users. To read other reviews click here. Disclaimer: I received these books free of charge, as part of the TOS Homeschool Crew. The above is just my opinion. Please remember that opinions may, and do, vary. Who is God and Can I Really Know Him?, introduces the concept of worldview while laying the foundational truths upon which the evangelical Christian worldview is built: God is truth and He reveals His truth to people; He is the one true and almighty God; He is the Father, the Son, and the Holy Spirit; He created everything; we are God’s children and are made to love and to praise Him; God meets all our needs; sin keeps us from God; and Jesus is the only way to God. My daughters and I have used several Bible study guides over the years. Some we have liked and some we have not liked as much. Some we have learned from and some not so much. I have been hoping to find something that would accomplish both, that my daughters would enjoy and yet also learn from. Something more than fluff, with lessons that would stick. So when the opportunity came up to review this book, I put my name on the list, hoping to be picked. When the book came in the mail, I was impressed. It looked so official. A big, heavy, hard-back book. Reminds me of a college textbook. If you like Apologia, it is a good guess that you will like this book. It is all about establishing a godly worldview. To know what you believe and why you believe it. And also to help your child prepare to defend their worldview while speaking to others who don't share the same worldview. Its official title is "What We Believe - Biblical Worldview of God and Truth - Volume 1 - Who is God? - And Can I Really Know Him?". It is the first in a four book series. Books 1 and 2 are available now. Book 3 later this year. Book 4 next year. It is broken into 10 lessons, each building brick upon brick, precept upon precept. The guideline suggests a schedule of 3 days a week for 2 weeks for each lesson. Following this schedule, it would take about 20 weeks to cover the book. It also has suggestions for keeping a notebook along the way. 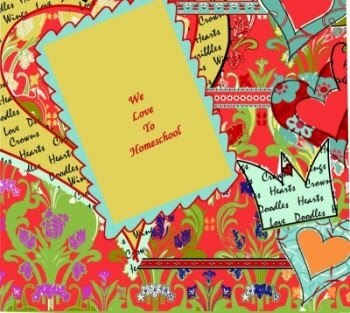 Each lesson has several sections called "Make a note of it" with questions and thoughts for the children to record in their notebook. It will help bring the points home and make them more personal; and it will also make a nice keepsake. We decided to use the book 4 days a week, but in smaller chunks than the suggested schedule. We tried doing the suggested amount for a few days. But it was too much for my 9 year old. It was hard for her to pay attention that long and to retain what she was hearing. So after a few tries, I decided to slow it down. I want her to enjoy it and to learn from it. And taking it slower has helped accomplish that. Each lesson has several different aspects to it. It comes at the message from several different avenues, helping different learning styles and helping to hold the younger ones' attention. Here are some of them. - An ongoing "Parable" of sorts about two young boys named Jeremy and Ben. Jeremy uses life examples to help his friend, Ben, learn about Jesus. - And the "Make a note of it" sections for the notebooks. The book is full-color, has lots of pictures, a nice easy-to-read print size, interesting sidebars. It is a very nice looking book. It flows nicely and is easy to use and read. Aside from appearance, it has great content. If you use this book, you will get a thorough look at a biblical worldview. It isn't just a cute story with a little moral lesson at the end. It is an in-depth study of "God and how we can really know Him." I am enjoying the study. I have a feeling that I am going to learn quite a few things myself. I know what I believe, but also like the idea of a "refresher" course on why I believe it. I am reading the lessons to my 12 and 9 year old daughters. Both are listening and learning and asking questions. I'm sure my 12 year old will get more out of it. But my 9 year old will learn enough for it to be worth the time. Besides, I plan to keep the book and can go through it again in a few years. We will learn things we missed and review what we have already learned. My 9 year old's favorite thing: The neat extras such as the optical illusions page. My 12 year old's favorite thing: The ongoing saga, "parable", of Jeremy and Ben that intertwines throughout the lessons. Here are some pictures to show how nice the book is inside. Do I like this book? YES! To see more reviews, check here. Disclaimer: I received this book free of charge, as part of the TOS Homeschool Crew. The above is just my opinion. Please remember that opinions may, and do, vary. Oh yes it is my friend. Don't you fret. Don't you worry. It is right around the corner. 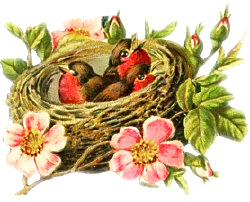 Birds are singing. Snow is melting. Temperatures are warming. And . . . get ready for it!!! The clock is springing forward in just a few days. That means more hours of daylight. Whoo-Hoo.